NOTE: Translating a workflow should be the last step of the workflow development process. Cora SeQuence supports several languages out-of-the-box. You can configure additional languages with minimal effort. You need to perform several procedures to prepare your workflow for translation. The first time you perform the workflow translation procedure, sCora SeQuence creates a directory and a language-specific resource file for the workflow. You will make all future modifications to this file. For example, if you designed a workflow in English, and want to translate the workflow to French, copy the template file and rename it to <Your Workflow Name>.fr-FR.resx. NOTE: fr-FR is the target language culture, and as such is hierarchically structured. For more details on the CultureInfo Class, see http://msdn.microsoft.com/en-us/library/system.globalization.cultureinfo.aspx. 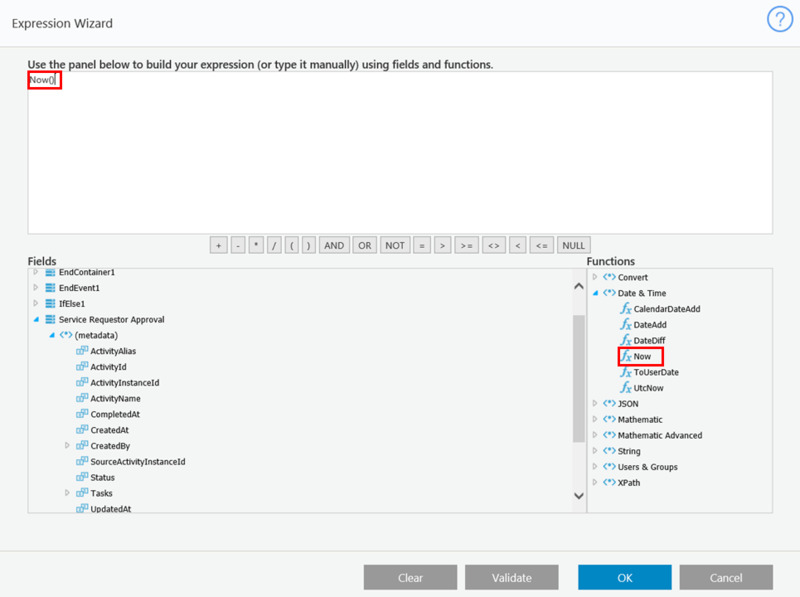 There are several parameters in the Globalization section of the Properties panel that require configuration and resolution before you translate the workflow. To access the parameters, navigate to App Studio > Properties panel > Globalization section. To enable these features, set the Localizable parameter to True. Formatting defines how dates and numbers display. Formatting is determined by one of the following. Enforce a format: select a culture from the drop-down menu. Thread of the application: selection (auto) from the drop-down menu. Enforce a language: select a culture from the drop-down menu. 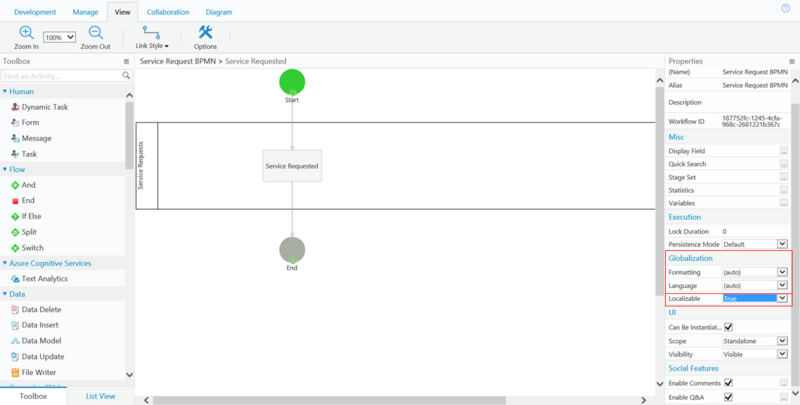 Open the workflow in App Studio. 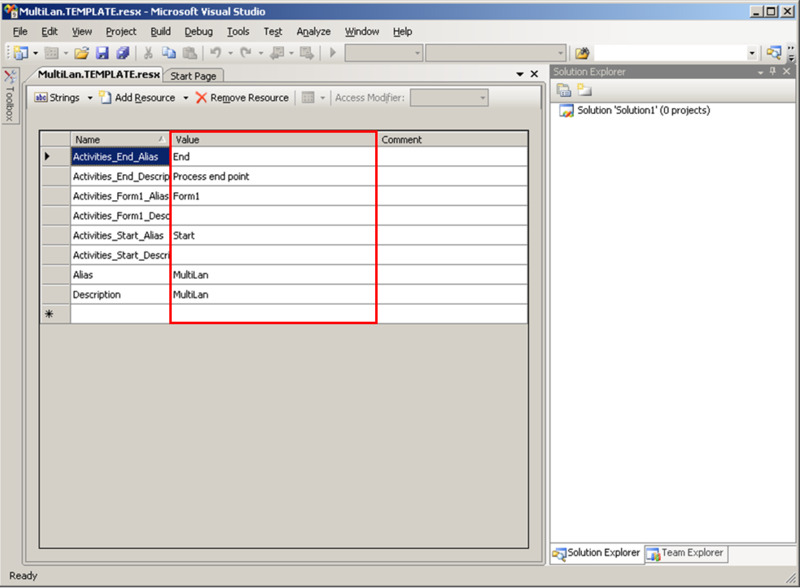 Navigate to App Studio > Properties panel > Globalization section, and set the Localizable parameter to True. 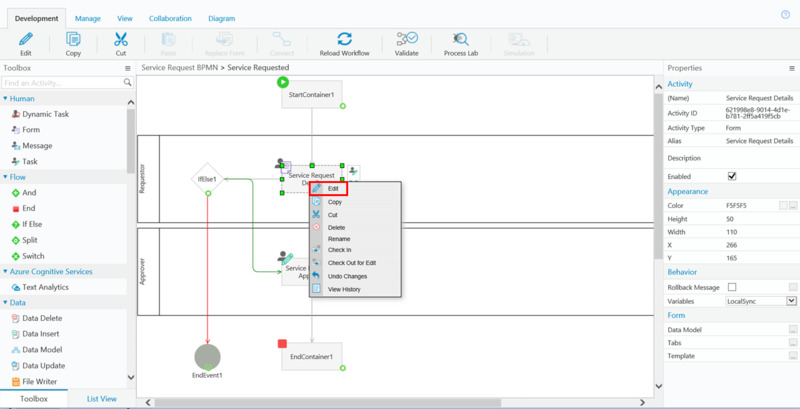 You must perform this configuration every time you add a new activity to the workflow. After you add the new activity, set the Localizable parameter to False and then set it back to True. (Optional) Edit the resource file name to reflect the translation target language. Open the resource file in a text editor and translate the content of the Value column. Visual Studio offers a convenient Excel-like experience. Perform IISReset to implement the modifications. Runtime Cora SeQuence expressions is an efficient tool for retrieving any information you need related to the runtime context. For more information, see Understanding Expressions. Runtime expressions enable users to retrieve data from the workflow resource file. You can use expressions to define default values, business roles, and much more, by using the following expression: rt.GetResourceString(<key from resource file>). For example, to return the localized workflow alias: rt.GetResourceString("ApprovalKey"). When you use Runtime expressions make sure that all available languages have a resource file. For example: <sq8:Label runat="server" Text='<%$sq8: rt.GetResourceString("Request_Form_Comment") %>' />. You can also use <%$ Resources: MyResourceFile, LabelText %> to hold the expressions. If you do this, you will have to maintain the translations in two locations. In App Studio, right-click the activity you want to edit and select Edit. In UX Studio, click the arrow next to a form field and click <New field...> to access the data field window. Select a data field that you want to edit. As an example, we are going to assign a default value for the RequestDate field in the form. In the Properties panel, click the ellipsis button next to the Default Value field. 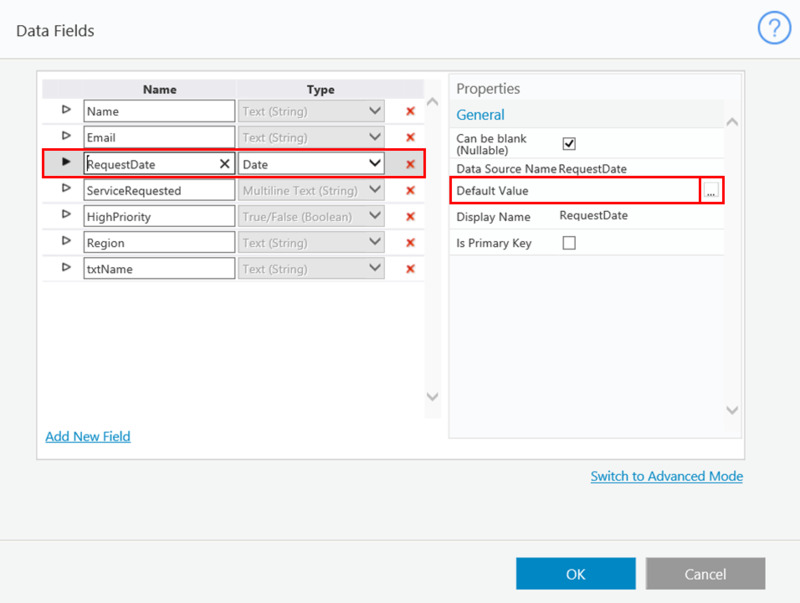 Assign a default value for the RequestDate field. For our example, we are going to assign the default value as the current day. In Visual Studio, create a resource file for the language that you want to create for the form. Add values to the resource file, in which the key is the value used in the form's markup and the "value" is the display value in runtime. Translate the resource file to the new language, and name it with a corresponding extension. Copy the resource files to the application's App_GlobalResources directory. The App_GlobalResources directory is located in the application root directory. For example, in the default Flowtime installation, the path is: C:\inetpub\wwwroot\Workflow Runtime\App_GlobalResources. If this directory does not exist, you need to create it. In your forms, use the key as we show it in the exmple below. Follow this procedure to change the display language in Flowtime. In Flowtime, click the Settings icon > General Settings, and select a language. Create a .resx file for each language that you want to translate the categories into. The file should include the tranlsated alias and description for each category. For example, if you want to translate the categories into French, the file should be Categories.fr-FR.Resx. The keys in the file would be CategoryName_Alias and CategoryName_Description. If one of the categories is Retail Banking, this is what the file would look like. 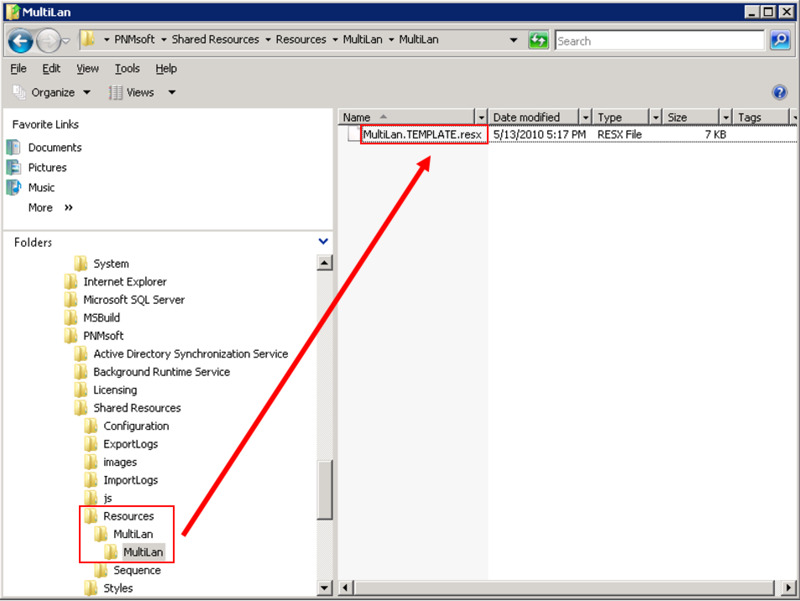 Create a folder named Portal in Shared Resource\Resources\Sequence. Put the category translation .resx files in the Portal folder.